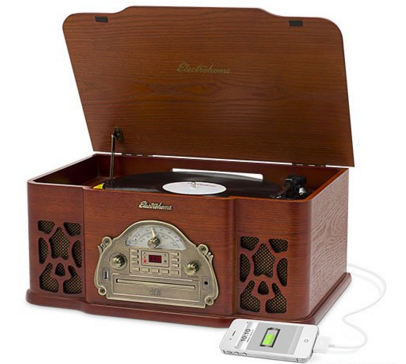 Electrohome Wellington Record Player Just $125.96 From $249.99! FREE Shipping! You are here: Home / Great Deals / Amazon Deals / Electrohome Wellington Record Player Just $125.96 From $249.99! FREE Shipping! Check out this amazing Christmas gift idea! This Electrohome Wellington Record Player is just $125.96 down from $249.99 and comes with FREE shipping! Get yours now while the price lasts! Record any vinyl album to MP3 through a built-in USB port without connecting to a computer. Just plug in your USB drive and press record – it’s that easy. “Diamond tipped” ceramic needle provides better audio performance with a warm and natural tone and will not harm even your most cherished albums.